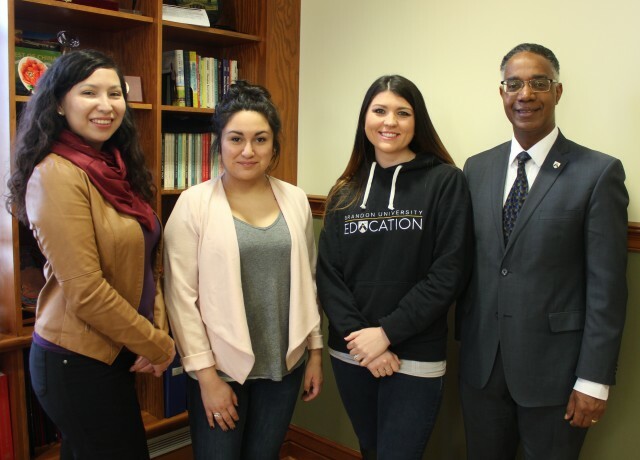 From left: Sarah Hobson, Chair of IANE (Inter-Provincial Association on Native Employment), Toni Bouchey, scholarship recipient, Brittany Skibinski, scholarship recipient, and Gervan Fearon, president of Brandon University, on Jan. 26, 2016. Both recipients of the second-annual IANE bursaries were once again Brandon University students this year. The bursaries, which first awarded a year ago, are presented annually to post-secondary students of Aboriginal descent in Westman, by the Westman chapter of the Inter-provincial Association of Native Employment. Last year’s recipients were both from Brandon University. Both recipients this year are as well. This year, the bursaries go to Toni Bouchey and Brittany Skibinski. Toni, from Fisher River, Man., is in her final year at BU, finishing her Bachelor of Arts, with a major in Native Studies. After completing my BA, she plans to go on to get her Education degree, and says her dream is to teach on northern reserves. Brittany is in her second year in the Faculty of Education after previously finishing a three-year Bachelor of Arts degree with a major in Native Studies and minor in Geology. She is proudly Métis and discovered a passion for her ancestry while she was taking Native Studies courses. Originally from Ochre River, Man., she says she has a passion for working with kids and always knew she wanted to be a teacher.